The Pointer dog is a powerful, yet graceful dog breed, with a very clear job: to point. The hardworking, even-tempered breed has a centuries-long history of pointing game birds. High-energy Pointers are capable of great speed and agility, making them a perfect companion for runners, cyclists, or anyone who is athletic, and their affectionate, loyal natural means they are an ideal family pet. Colors: Combinations of white with liver, lemon, orange, or black markings. May have solid coloring in any of these colors. A noble breed, the Pointer dog dates back to the 17th century. It’s believed that they are related to the Greyhound, Bloodhound, Foxhound, and a setting spaniel in existence at the time. 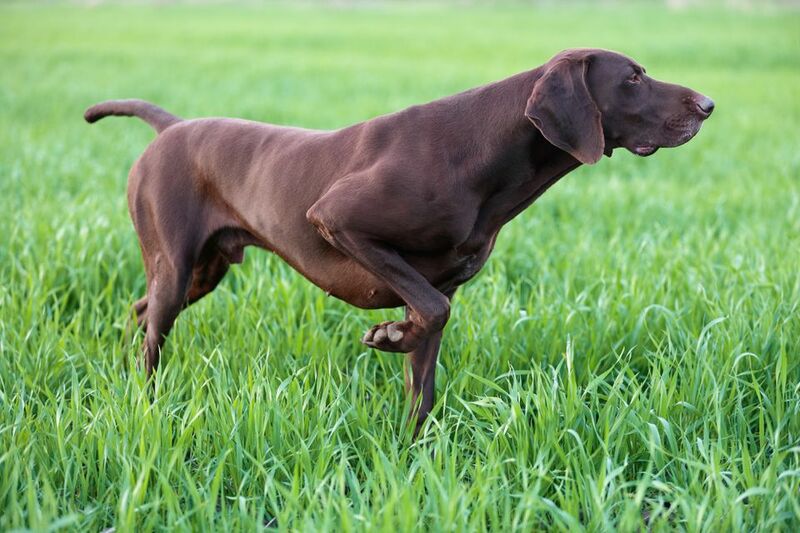 Though they’re widely known as bird dogs, the original job of the Pointer was to find hares for Greyhounds to course. The breed adapted to point for birds when the use of guns during hunting excursions became more popular, and they've remained extremely common as bird dogs ever since. Before the development of guns, the Pointer’s role was just as important, as birds were netted rather than shot. When guns started being used, the Pointer was still needed to both point as well as retrieve the bird. The Pointer’s shape is instantly recognizable; both its long head and finely pointed tail help do their job of pointing game for the hunter. A Pointer will stand tall and still with one foot off the ground to point the hunter in the right direction. Though they have always been alert and focused in the field, over the years, the Pointer has become a mischievous, playful, and fun-loving companion at home. Today, Pointers frequently win some of the country’s most prestigious trials for pointing dogs in the country. Thanks to its sporting dog heritage, competitive nature, and love of attention, this breed is a natural at dog sports such as field trials, rally, agility, and obedience. Like many sporting breeds, the Pointer dog is an affectionate, loving dog that’s devoted and loyal to their family. They are friendly and welcoming to new people. The intelligent, non-aggressive breed is very good with children and other pets, as they can be very intuitive and sensitive along with active and playful. The breed is happiest when they’re in the middle of the action—and always wants to be wherever their family is. Thanks to its need to always be alert in the field, the Pointer can also make for an adept watch dog. While they are active dogs that enjoy being outdoors, most Pointers actually prefer to be indoors with their owners hanging out on the couch. These highly athletic dogs will still require regular daily exercise, and overall are generally calm and relaxed dogs. Their athletic history means this is a dog that loves to run and should have ample opportunities to play off leash in a safe environment, such as a fenced-in backyard. When not given the opportunity to burn off some of their energy and never-ending endurance, a Pointer will not be as calm and content in the home and could potentially become destructive, particularly if left alone for long periods of time. The Pointer’s short coat keeps grooming simple. These dogs are average shedders and will need to brushed regularly and have their ears cleaned on a routine basis. The Pointer dog’s intelligence means they are very trainable. Like other sporting dogs, they can be sensitive and may not respond well to more harsh training methods. Instead, they thrive on positive reinforcement like praise, treats, and other rewards. While generally a healthy breed, the Pointer can be prone to a few common health conditions, including canine hip dysplasia, allergies, epilepsy, and certain eye disorders. Pointers can also experience bloat, a life-threatening stomach condition. The Pointer dog should perform well on any high-quality dog food, whether it's commercially-manufactured or home-prepared with a veterinarian’s supervision. The breed’s diet should be appropriate to their age, and while this dog is highly trainable, care should be exercised when giving treats as rewards as they can lead to obesity. While the Pointer has average dietary needs, they will require more exercise than other breeds.